It helps to know what you are getting into when you walk into any mobile home investment. In a perfect world, the owner of record and selling the home also has ownership according to the title and is in possession of the title. If the owner is not in possession of the title but is the owner of record, they merely have to contact the title issuing authority and pay a small fee in order to get a new title. In some cases, the owner never transfers the title to his or her name. This can be a doozy if you cannot track down the original seller. If you are able to contact the person who last sold the home, you may easily convince them to transfer the title since they may otherwise be held liable for taxes or any other costs associated with ownership of the home. Keep in mind that in some instances the involved parties created a less formal bill of sale. This is not a title and may suffice for everyone immediately concerned but is not legally binding and ownership still lies with the title holder until that is effectively transferred into the name of the buyer. If the documented owner is no longer alive and you can get power of attorney, you should be able to transfer the title as needed. If you see that for some reason the seller never transferred the title into his or her name, you are wise to be suspect. There may indeed be an underlying reason for this. Perhaps they cannot. They may have fallen behind on taxes and a hold may be placed upon any title activity. Owing back taxes can become a major pitfall during a flip. Perhaps one of the most common title issues is a title that is available but doesn’t contain the necessary signatures. If the previous seller has already signed but nothing else was filled out, the current seller can simply sign off as the previous buyer and then transfer the ownership to you as the current buyer. It sounds tricky but is a fairly straightforward process. Finally, there may be active liens on a title. It’s imperative you check to see if active liens are attached to the title. If that is the case, you can either obtain proof the liens were paid and there is no debt owed, clearing the title or you can have the lien holder sign a release of the lien to clear the title. You don’t want to get stuck with a title you haven’t looked into and a property with bad debts placed against it. 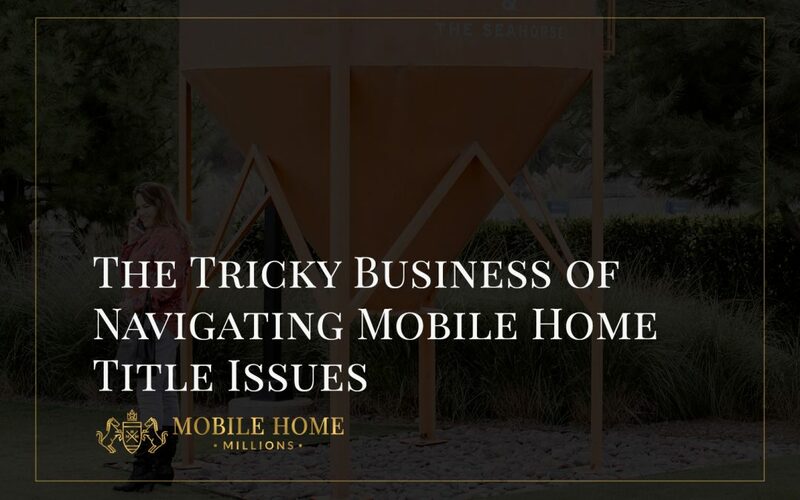 This is a very broad listing of some of the primary issues you may run into when dealing with mobile home investing and obtaining proper titles. The most important thing to keep in mind is that accurate and current ownership has to be an important founding step. Do your research, make sure you have not skipped steps in the process of obtaining titles and that no stone is left unturned in investigating oddities in title ownerships. This is a very telling aspect of your mobile home investments soundness and skipping through this could be detrimental to the success of your dealings.